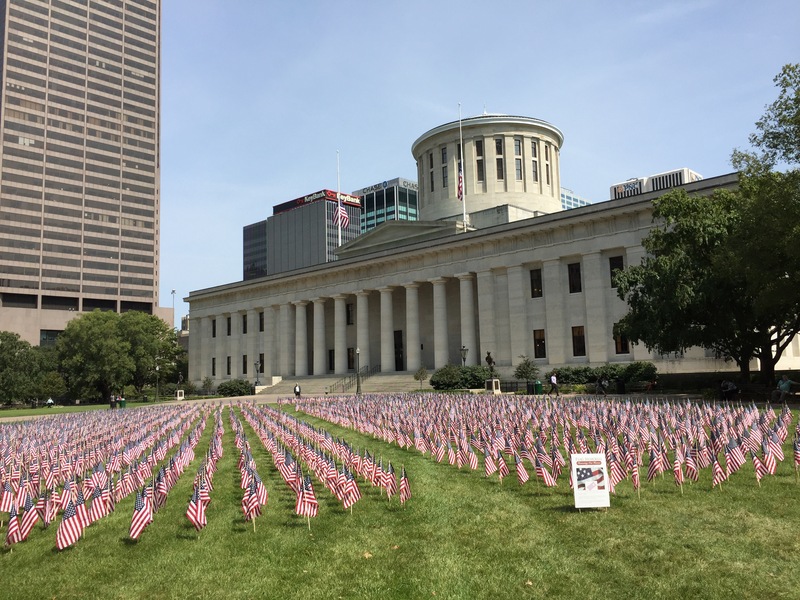 Today, the Ohio Statehouse lawn was graced with hundreds of tiny American flags arranged in neat rows. The Flag Memorial featured 2,977 flags — one for each of the people murdered in the terrorist attacks on September 11, 2001 — and were configured to group the flags to reflect the people who were killed at the World Trade Center, the Pentagon, and the downed plane in Pennsylvania. 2,977 flags is a lot of flags, and 2,977 lives was a lot of lives. It is important for us always to remember that. By now most of us have seen the video footage of Democratic presidential nominee Hillary Clinton apparently collapsing in the arms of staff and Secret Service agents and being dragged into a van after an abrupt exit from a 9/11 ceremony. After first saying that Clinton was simply “overheated,” her campaign later released a statement from her doctor that, three days earlier, Clinton had been diagnosed with pneumonia. The problem at the 9/11 ceremony, the doctor said, was that Clinton became dehydrated. Having pneumonia certainly doesn’t disqualify a person from being President. We’ve had Presidents who have dealt with lots of illnesses over the years, and pneumonia is a treatable condition thanks to the miracle of modern medicine. Still, I think the pneumonia incident is a problem for the Clinton campaign, because it once again suggests that Americans aren’t getting the whole story. Clinton has been dogged by coughing fits that have produced lots of chatter about her health — chatter that her campaign has tried to downplay as the feverish imaginings of right-wing nuts. Now she experiences a public health episode and has to be physically supported and lifted into a van, and the campaign first tries to downplay the incident. Then, when the story starts to really take hold, the campaign discloses that days earlier Clinton had learned she had pneumonia. You have to wonder whether her real condition would have been disclosed but for the fact that someone took a video that showed Clinton’s apparent collapse — a video that would make any fair-minded person wonder about her health. This pneumonia incident is just one more example of the Clinton approach to bad news, whether it’s the investigation of her email practices, her fundraising speeches to Wall Street fat cats, or other issues. The first reaction is to deny, deny, deny, attack the messenger, and hope that friends in the media and the political world will cooperate in quashing the story. The facts ultimately come out in dribs and drabs, and you never feel like you get the whole truth. Trust and credibility are important characteristics of a presidential candidate. Voters want to believe that the candidate of their choice is open, above board, and a person of integrity. The Clinton penchant for secrecy and denial is antithetical to that kind of belief. It’s one of the reasons why Clinton isn’t pulling away from Donald Trump, despite his many flaws. With the pneumonia incident we’ve just been reminded of her credibility issues in a very public, visible, undeniable way. It will be interesting to see how the voters react. Today is the 15th anniversary of 9/11. On this quiet Sunday, many Americans will recall the horror of that awful day, the nightmarish quality of the footage of crashing planes and burning, collapsing buildings, and the heroism of those who responded to the worst attack against the United States since Pearl Harbor. Fifteen years is not a long time, but it’s long enough to begin to assess the historical significance of 9/11 — and it is becoming clear that our world was dramatically changed, and probably permanently, on that fateful day. In the years since, terrorist attacks on America and the rest of western world have, unfortunately, become commonplace. An enormous security apparatus has been created to try to protect us from future assaults, and in our zeal to achieve such protection we’ve authorized incursions into our personal liberties that would not have seemed plausible during the carefree ’90s. We’re routinely scanned, videotaped, patted down, and probed these days. And the threat of terrorism and security issues also have created new perspectives on formerly run of the mill political issues — like immigration. When 9/11 happened, it was a terrible shock, but we did not know what the future would bring. There was resolution, of course, but also a sense of hope — hope that Osama bin Laden and al Qaeda could be defeated, and hope that the world could return to what it was. Now we have 15 years of history under our belts, and it seems that such hopes will not be realized. Even as the fight against terrorism has killed bin Laden and decimated al Qaeda, new groups like ISIS, fueled by a hateful perversion of the Islamic faith, have sprung up and become committed to destroying western culture and imposing violent, intolerant, medieval policies in its place. 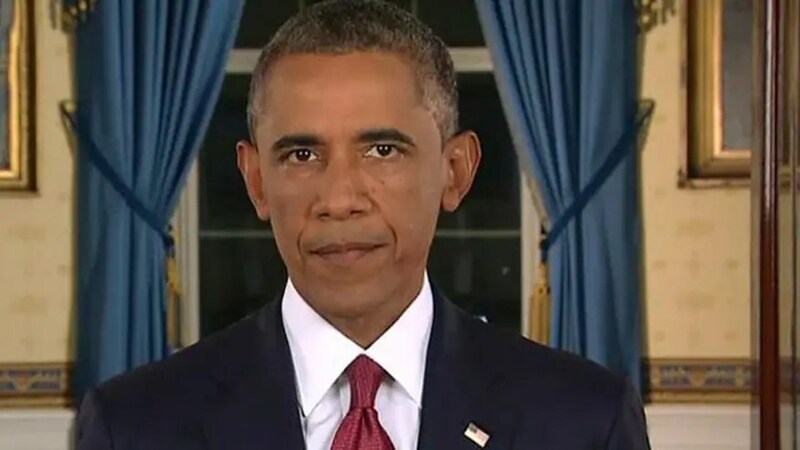 With each new shooting, bombing, and attack in San Bernardino, or Paris, or Brussels, all committed by people radicalized by their indoctrination into dark ideologies, it becomes increasingly apparent that this is not a fight that can be conclusively declared to be won, but instead a long, constant struggle against loathsome groups, cells, and individuals that just want to inflict harm and are perfectly comfortable with killing innocents to achieve their twisted goals. America and its western allies simply need to continue that desperate fight against the forces of evil. Fifteen years later, we are dealing with a sobering reality. Fifteen years is not a long time, but the world of 9/10 seems like an eternity ago. 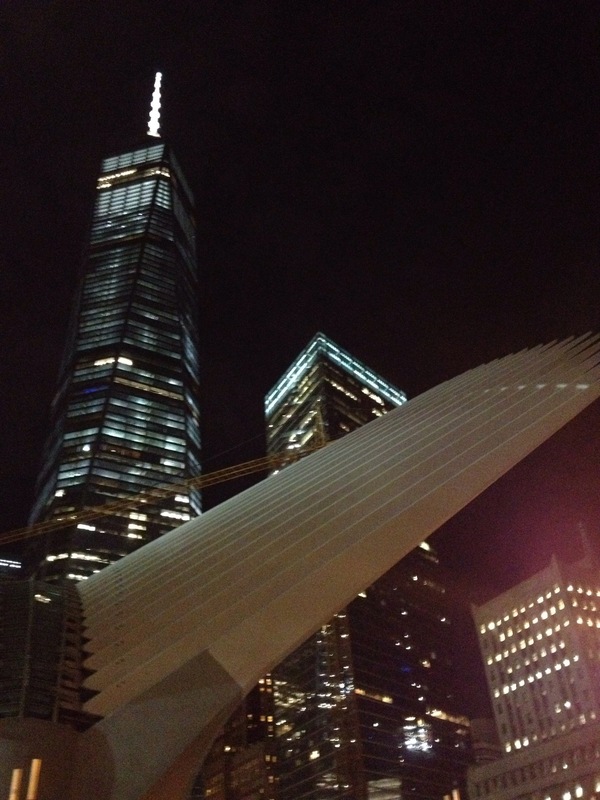 Our evening stroll also took us to the Freedom Tower, built on the footprint of the World Trade Centers. I was here soon after 9/11, when recovery operations were still underway, and again when the memorial was complete but the building was still being constructed. I’m glad it is completed, although I’m not sure what the bat wing canopy signifies. It is still not easy to be at this place, now 14 years later, but the fact that we have rebuilt sends a message. Richard has moved over to the Metro desk at the Chicago Tribune, and yesterday he had a fine piece in the paper about an art exhibit that includes pencil drawings of every Illinois soldier killed in action since 9/11. The exhibit, called “Portrait of a Soldier,” includes more than 300 drawings of members of the Army, Navy, Air Force, and Marines. It’s a touching piece about a gentle way of remembering what has happened in the aftermath of 9/11, and the sacrifices that our men and women in uniform, and their families and friends, have made since that terrible day. Interesting, isn’t it, how art can be such a powerful way of expressing things, and how something simple like a pencil sketch of a soldier can nevertheless have profound meaning? Thanks for the Rafting Roommate for sending this along to me. Kish and I watched President Obama’s speech about our response to the depravations of the Islamic State in Iraq and Syria last night. I think we have to do something about those vicious Islamic terrorists, so I am glad the President has decided to take action. As for his strategy — well, if it doesn’t work, we can try something else. The main takeaway is that we’re going to act, once again, in an effort to lead the world to a better place. This snippet of happy-talk was dubious — Our universities are great when they are gouging students with outrageous tuitions and producing debt-crippled graduates? Our auto industries are thriving when GM produces defective cars while living on federal support? — and obviously has nothing to do with ISIS or terrorism. It came across as unseemly politicking as a mid-term election approaches and thereby detracted from the rest of the speech. Perhaps the President doesn’t realize it, but when he is addressing national security and describing our strategy to defeat another bloody terrorist group and then veers into campaign mode, he presents himself as focused on internal politics and less than serious about the external mission he is announcing. It’s not a positive juxtaposition. Today marks another anniversary of 9/11 and, as a result of the President’s speech last night, we will open another front in the long and difficult struggle against terrorism. The memories of that black day 13 years ago remain raw and painful. Due respect for 9/11 requires that our leaders continue to focus on our bipartisan, national goal of keeping our country safe from another attack. When 9/11 is invoked, electioneering should not follow. It’s another anniversary of 9/11, and it has been strange to be in the New York City area, just across the river from lower Manhattan and the site of so much carnage and chaos on that fateful day. 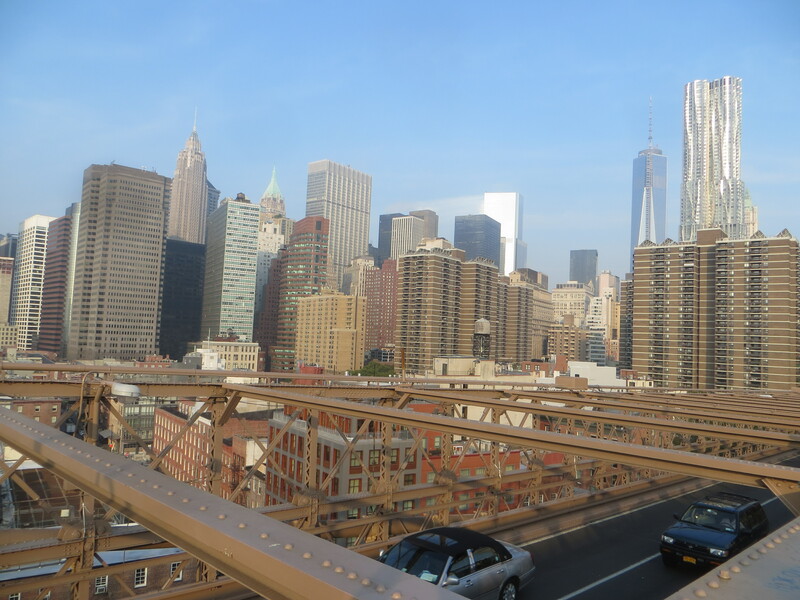 When we walked across the bridge this morning and saw the new One World Trade Center building rising above the skyline, it brought all the awful, painful memories back and gave me chills. It hurts to remember, but we must never forget.